Last afternoon, we caught up with probably the most successful ad maker of today- Amitabh Reza. We spoke of various issues ranging from consumerism, film making, modeling, understanding film and how to develop the film industry. Being an economics graduate he knows the entire ism's very well and that's why when I asked him if the ad films were promoting consumerism he replied in affirmation. Although its true that the intention of ad films is to create consumerism but nowadays some programs in all our local TV channels are promoting that too. It can be argued that consumerism may leave a light scratch on satisfaction. As far as film making is concerned he said that it's a passion. As a kid, adolescent and grown up he was always a film enthusiast. Having worked with him for sometime I can say that academic education interested him the least but I must say that he is a very learned person and knowledge does not necessarily need to come academically as it can come from reading books, watching movies, understanding life and culture. If someone is interested in film making, one must first understand the film language followed by specifying the film genre that he/she is interested in such as whether someone is interested in ad film making, documentary, blockbuster or independent film; one has to understand that very well. After the first two steps he/she must go to a director and start assisting him and once you are done with a handful of projects you are ready to be on your own. However, like life, film is a learning process too; you will learn and understand more as you take on the adventurous journey. With the growth of the media industry in the form of increase in number of channels and news papers; models, show hosts, news casters etc are very much in demand and certainly the demand if growing but adequate supply of quality TV personnel is scarce. He also said may be it will be a huge profession in the future as you can see that in India. For the ones who are striving to be models, it is necessary for them to make professional portfolio and drop it at various ad firms. Once we started talking about the films he told us that it is necessary for one to understand the film language in order to understand a film. A film is very simple it is either you like it or you dislike it. But film is such an entertainment which plays in your subconscious mind for example if someone is speaking French and you don't know the language you will not understand anything but if you watch a French film you will understand it. This is because a film has gestures, expressions and a philosophy which combines together to give you a meaning. Amitabh Reza also told us that one movie theatre in the form of Cineplex has inspired many desi movies and requested for such cineplexes to be in all the major cities such is Barisal, Rajshahi, Sylhet, Bogra etc. He said that once there are such theatres in all these places the movie industry will boom and that day is not too far when you may experience 4-5 bangla movies of premium quality every month. 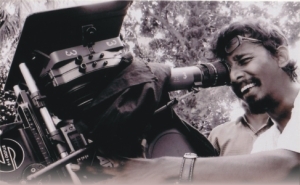 Amitabh Reza is an inspiration for us since, in spite of being the most sought after director of the country he has made his time to give an interview for the Rising Stars aswell as teaching film language and ad film making in various workshops. He also revealed one of his secrets that he may eventually come up with a film in a while.